Bill was given a challenge earlier this summer by Kenny to build a three pound Ultra-Light guitar. After a lot of development work & time, this challenge was met with a guitar that weighed in at 2 lbs, 15.9 oz. before Kenny installed his pick-up. Our goals were to make an acoustic guitar that was lighter and thinner than our standard SJ but with a great acoustic tone both plugged in and unplugged. Bill met the mark! And we used our short scale neck to keep the reach around the guitar very comfortable. We were able to hear this guitar live in concert... the sound was incredible! This shattered all stereotypes of a thin body light weight acoustic not being able to command its presence! 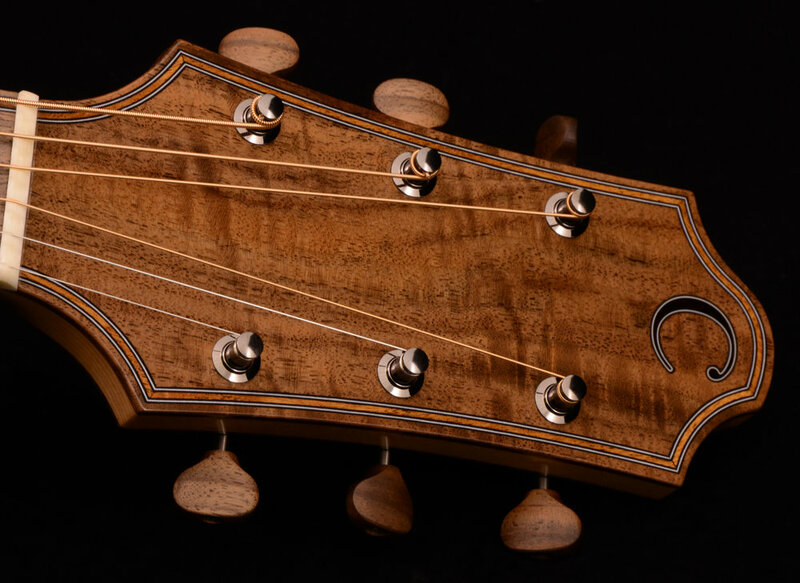 Specs for Kenny's Ultra-Light include: Adirondack Top; Ambient Figured Mahogany Back/Sides; Claro Walnut Binding; Ambient Figured Mahogany Top Trim; Claro Walnut Backstripe; Claro Walnut/Abalone Rosette; 3 pc Sitka Spruce/Claro Walnut/Sitka Spruce Neck; Claro Walnut Fingerboard & Headstock Face; Ambient Figured Mahogany Fingerboard & Headstock Trim; African Blackwood "C" Logo; Ambient Figured Mahogany & Claro Walnut Headstock Back, Cosmo Black Stealth Gotoh Tuners with Claro Walnut Buttons; Claro Walnut w/Ebony Bridge Pins & Mahogany Dots. The Charis "Air" SJ is now an available build option for those interested in a thinner bodied light weight guitar.